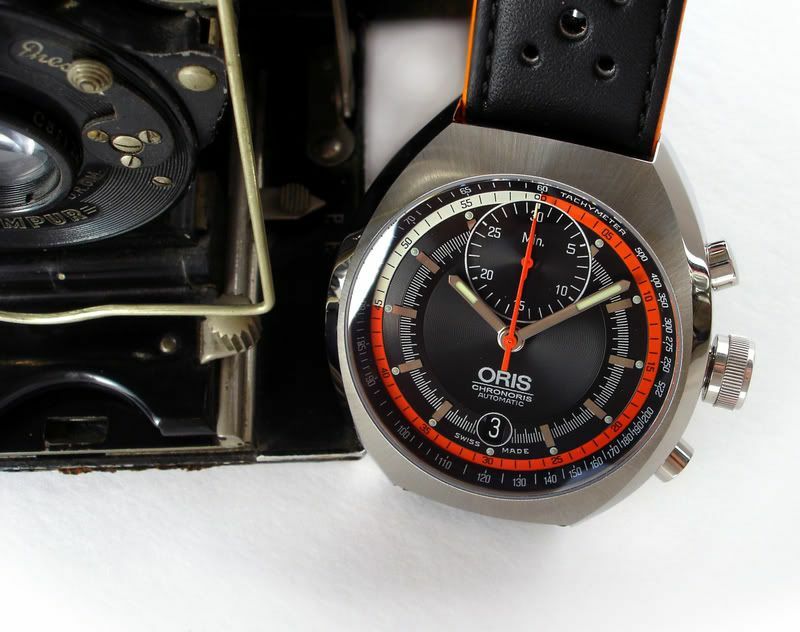 Thread: New Oris? Deal or No Deal? I Hope you'll pardon a link to another forum...I'm no good at that picture linking stuff. What are the thoughts over here? I must admit I really, really like it so far. I do like this one Dave posted, but I like the cleaner look of the watch on Gary's post a bit more. The verbose wording, "10 minute countdown" would kill Dave's model for me, personally. Gimme some mystery! I like it clean. I have been wishy washy on Oris. However, that chrono is the cat's meow... as long as it is it's own man.... if you know what I mean. Oris tends to borrow a page now and then. Last edited by T.R. ; 20-11-2008 at 00:10. I thought you might like it, and especially the orange version more, obviously I like the Greenness for the fact its different, and I have a vague fondness for GMTs. I probably can't justify too many more watch purchases, and I want to get a GMT at some point. I dunno, it isn't really doing anything for me. I too prefer the version Gary posted. I like the Green one for the same reason....go for that one. ATG Guide to posting LINKED pictures. Press New Topic or Reply on the ATG Forum then go to the other Browser with the page that contains your picture. Right Click on the pick you want to show on the Forum, that will bring up a small info box with all details of the picture including its Web URL address. Click on the address and highlight it by dragging or Press CONTROL and A together. Right click and press copy or Control and C.
Now go to the ATG Posting Editor window with the smileys down the side. Right what you want to say, return, return. Click the Yellow Picture Box. Remember you still have the picture URL on your Cipboard/end of your cursor. Highlight all letters in the box (it provides the beginning of a web address HHTP:// which you don't need so paste over it by right clicking and pressing paste or CONTROL V.
Press ok and the address of your pic with [image]orispicURL[image] will be pasted into your posting page. Return return and write some more. Try and get used to using CONTROL A (highlight), CONTROL C (Copy) and CONTROL V (paste) and it gets really easy and quick. This technique can be used for ANY pic. So say I post about Rolex Submariners and you want to say that the Green one is great and want to emphasize your reasons with a pic? Just go to Google, put SUBMARINER LV or SUBMARINER GREEN in the search box. When results come up look above and it gives you the types of search, Click Images and Google will display alll SUBMARINER LV images, click on one until it is displayed at full size then begin the process of Linking to your Forum Reply or Post. Honestly it is very easy and let's you get some cool opinions across very, very well! Below are the Guides for both Internet Explorer and Firefox. Hop this helps and I will copy this post as a sticky for anyone else who wants any tips. Been fancying one of these for some time. I'm giving up on regular chronos because I just don't make use of the functionality and it is therefore un needed clutter on the dial, BUT that doesn't discount a simple chronostop style watch from finding its way into my affections. The Omega is nice, but I don't really want to have to mess about with an internal bezel which is what makes this watch so appealing - that and pretty darn good looks. As rare as rocking horse poop on the second hand market though which either means no one buys them in the first place or they are good enough to keep. I know about the £!!! You should definately stickie it somewhere.